Cover Story: 1968 - A musical journey through a revolutionary year A very special year turns 50: we roll it up month after month and show how music on vinyl has become the engine of counterculture. Vinyl-Report Cologne, Bonn and Aachen In the second part of our journey through the Rhineland it's the southern part: MINT visits record shops in Aachen, Bonn and the vinyl capital of the West Cologne. Bauer Studios - live on site Long live the moment! A visit to the Direct-to-Disc experts in Ludwigsburg, where concerts are recorded without the possibility of correction. Revealed: Ghost - Presource The fourth album of the Swedish occult rockers is making waves - also because of its impressive artwork. We reveal the secrets of the cover. Johnny Marr on Iggy Pop Johnny Marr wrote rock history himself with The Smiths. In MINT he bows to his great idols: Iggy Pop And The Stooges. Dr. MINT Seal of approval or deceptive packaging? Dr. MINT explores the question of what the increasingly inflationary term'audiophile LP' really means. tape machines There will be no mass phenomenon - nevertheless it is astonishing: Tape machines will be produced again. What is behind the comeback? Further topics of the issue Over 100 LP reviews, the'33 1 / 3-Cover' section, news features, vinyl preview, record exchange dates, the sleeve face of the month and much more. 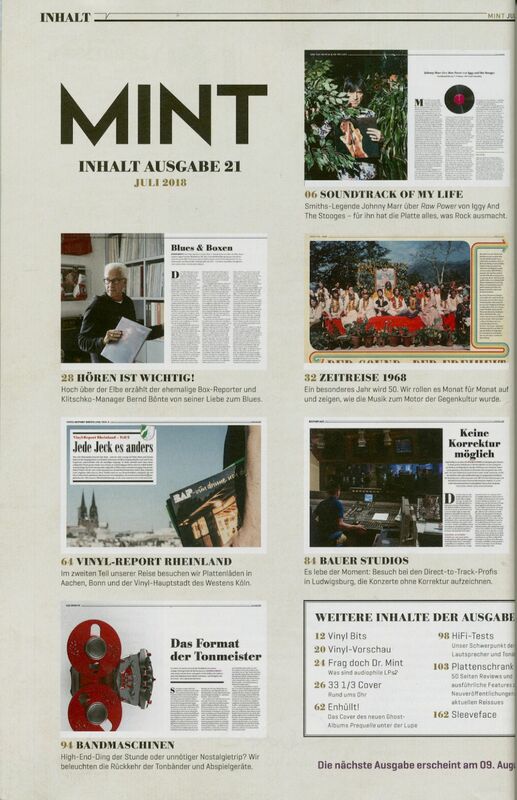 Customer evaluation for "Mint Magazin #21, Juli 2018"